Figure 11.5 Summary of the POSSM model evaluation methodology (Lauer, 1979). were evaluated and one model was selected as the standard against which to compare the other models. 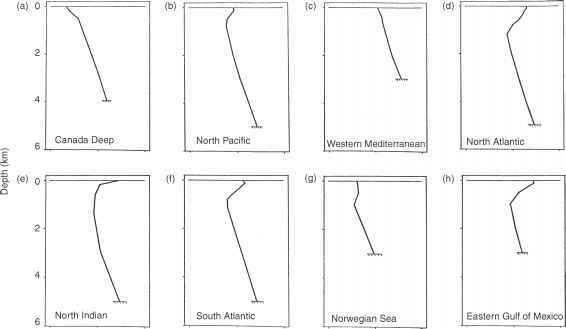 More than 10 different model versions were evaluated using an ocean environment described by a single sound-speed profile and a flat bottom (i.e. range-independent environment). where i is the case index, j the range interval index, Nc the total number of cases, Nr. the total number of range intervals for the ith case, Wjj the weights in each case and range interval bin (AR)j to be applied to mean values of transmission loss (TL) differences, and Wj the weights applied to ij standard deviations of TL differences. In the event that all values of Wj and Wj were chosen to be unity, CAMM became the "grand" mean taken over all cases and range intervals, and CAMff became the "grand" standard deviation taken over all cases and range intervals. The weighting functions (Wj, Wj) were functions of the acoustic frequency (f), source depth (Zs), receiver depth (Zr) and range interval (AR).